Once you try it, you'll be amazed how easy it is. Commonly called "Maui Carry" although the extension trick is new to me. For aerodynamic reasons, I carry the board in my downwind hand with the tail pointed into the wind. At the Squamish spit, it means: From parking to rigging area, board in left hand, tail pointed to the direction of walking. From rigging area to parking: board in right hand, nose pointed to the direction of walking. 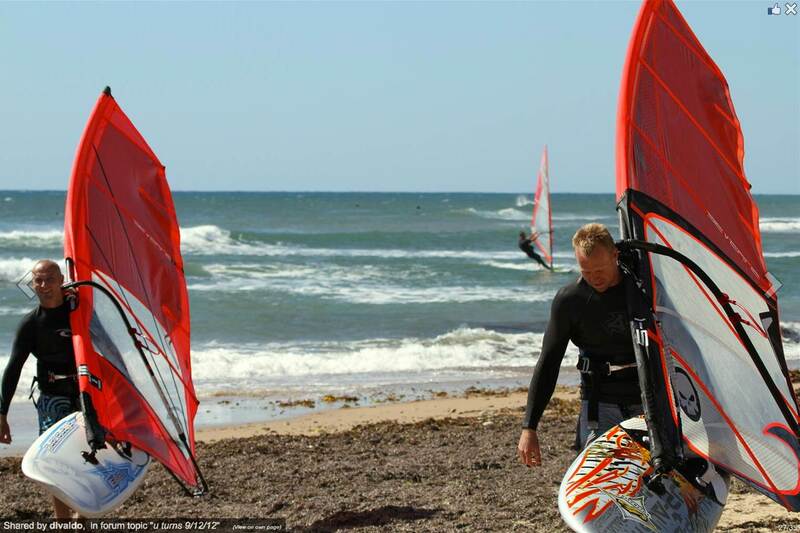 The extension trick lets you carry the board easily up to 40 knots of wind! What I really want to see demonstrated is how to correctly lift and carry both your board and rigged sail on your head. Every time I've tried this it didn't go according to plan. It's likely a useful skill for those long walks at Centennial Beach which are coming soon. Anyone have a good demonstration of this? mjamero wrote: What I really want to see demonstrated is how to correctly lift and carry both your board and rigged sail on your head. Every time I've tried this it didn't go according to plan. It's likely a useful skill for those long walks at Centennial Beach which are coming soon. Anyone have a good demonstration of this? If you notice it's only really done in off/side-off wave locations. In onshore/side-on it's a great way to wreck both neck and sail. Better to Maui Carry then rig on the beach. Last week two different groups of windsurfers commented the same day about me carrying my gear down the spit road in one walking trip! Trust me, it's not strength. Technique! Used the extension technique this past weekend, works awesome. Don't hunch your shoulders when you carry gear. Keep your shoulder blades down and back. Keeps your arms as straight as possible when carrying a load (downward).